Auckland, April 4, 2014 (Alochonaa) :There is an agreement currently being negotiated which has the potential to cause a paradigm shift in international relations. Since the signing of the Treaty of Westphalia in 1648 ended the 30 Years War, the concept of national sovereignty has dominated the way states interact. Put simply, national sovereignty meant that states were in ultimate control of what happened within their own territory: outside forces had no power (except by conquest) to influence an independent state. For better or worse, the Westphalian ideal has been slowly eroding ever since it was signed. This erosion has taken the form of treaties, such as the Geneva Convention; international organisations, such as the United Nations; and regional groups, such as the European and African Unions. All of these agreements and organisations limit states’ powers to do as they please within their own borders. An example is that members of the European Union are bound by any decisions made by the European Court of Human Rights. However, the Trans Pacific Partnership Agreement (TPPA) represents a worrying further step: it offers a future where multi-national corporations and business interests can coerce states’ actions. 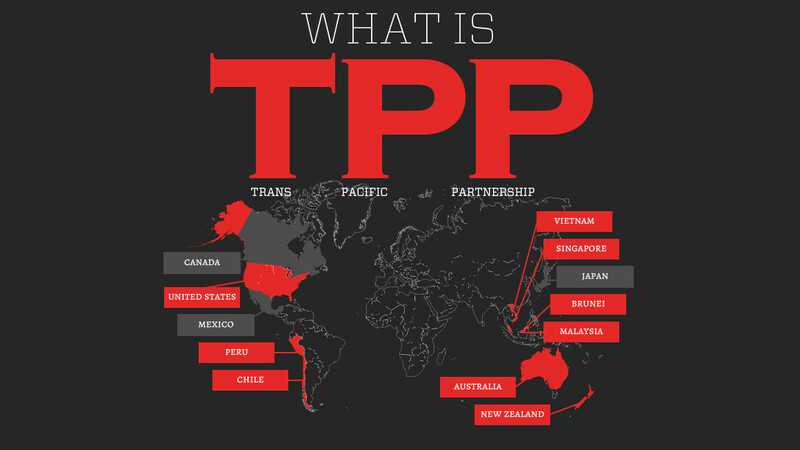 The TPPA began as a free trade agreement called the Trans Pacific Economic Partnership Agreement, between New Zealand, Chile, Brunei and Singapore. All of these countries were relatively equal players in negotiations. However, over time, many more countries have attempted to join negotiations, and the inclusion of the United States has fundamentally shifted the nature of the agreement. There is concern that, rather than an equal trade treaty, the TPPA has become a US-dictated, or at least US-dominated, affair. Of most worry is the prospect of the arcane sounding “Investor-State Arbitration”. This process allows foreign multi-national corporations to initiate disputes with sovereign governments, in effect granting them the power to sue these governments. When abused, these Investor-State Arbitrations grant such companies unforeseen powers to dictate states’ actions. This is especially dangerous given that many multinational companies have revenues greater than whole countries: it could see the dynamic of international relations shift in favour of unelected corporatocrats. Problems may arise when the threat of such a dispute prevents a government from pursuing legitimate policies which would harm those companies. In 2012 Chevron used these mechanisms to put pressure on the Ecuadorian government in an attempt to avoid an US$18 billion settlement for one of the worst oil-related disasters on the planet. There is concern in Australia that its attempts to initiate plain packaging for cigarettes might be threatened by disputes from tobacco companies, who view such restrictions as against the guidelines of the World Trade Organisation. Indeed, one such dispute is currently taking place, between the Australian Government and Philip Morris Asia. Similarly, there are fears that New Zealand’s state-run pharmaceuticals monopoly Pharmac may be open to supra-legal litigation by American pharmaceutical companies. Perhaps the most worrying aspect of the TPPA, though, is that it is being kept almost entirely secret: the content of the negotiations is not being made available to the public, even (or especially) the public of those countries negotiating. These citizens will have no opportunity to object to the contents of the agreement until after it has already been signed. This negotiation is much less transparent and accountable to the public than other free trade agreements, including the Australia-New Zealand Closer Economic Relations, where the public is notified of what is being negotiated ahead of time. In contrast the lack of information effectively prevents them from forming an informed position on the TPPA – excluding the pubic from the decision-making process. Furthermore, of the 29 chapters of the TPPA, only 5 are actually related to trade policy, and there is no indication of what the bulk of the agreement is actually about. This secrecy is particularly worrying in a New Zealand context, where key aspects of the constitution, including the Bill of Rights Act, are ‘ordinary statutes’. This means that, if required, key aspects of these key frameworks could be overturned or amended by a simple majority in parliament, in order to meet New Zealand’s TPPA obligations. Such worst-case-scenario thinking is an unsurprising consequence, given the secrecy and vagueness which has surrounded negotiations thus far. This vagueness has also raised concerns that the United States is attempting to use the TPPA as a weapon against online piracy, by globalising its own copyright paradigm (including punitive lawsuits). There seem to be indications that American negotiators want to institute trans-Pacific copyright law modeled on their own. Because of the influence large content multinationals (such as Fox, Sony-Viacom, Universal, etc.) have on American copyright law, some have argued that this could become effectively legislation by foreign corporation. The TPPA is a problem for those concerned with maintaining their country’s sovereignty. It’s a boring topic, especially when compared to wars in Eastern Europe, and political scandals, with the result that it has largely flown under the radar. Despite this, it is something that the public should find out about. There are limited leaks of the content of the draft agreement. By writing letters to their representatives expressing misgivings with this agreement, the publics of the countries concerned may be able to have their voices heard. *Peter is based in New Zealand and holds a Masters degree in Political Studies. He is most interested in Electoral Systems, Authoritarian use of New Media and Asia-Pacific relations.He established the Grafton Project, A New Zealand based Policy focused think- tank/blog. India Election: Ripple Effects in Bangladesh Politics? Really interesting article Peter – I’ve heard nothing of this anywhere else. I was more than happy to discover this site. I want to to thank you for ones time just for this wonderful read!! look at new things in your website. Not sure if anyone is interested in reading further on this subject but there are a few articles in the Sydney Morning Herald and quite extensive reporting by Public Citizen (Ralph Nader’s excellent consumer protection organisation). I am really concerned about this treaty which will decimate environmental protection and labour laws. In Canada, North American Free Trade Agreement has a clause that allows corporations to sue states for loss of POTENTIAL profits. Right now Quebec is being sued because it has put a moratorium on fracking until more research can be done as to the potential environmental dangers. The state of Quebec is being sued for two hundred fifty million dollars by Lone Pine Resources for a potential loss of profits. This is relevant because the very clause in NAFTA, the Investor State Dispute Settlement (ISDS) is in the TPP. While Labour in Australia was keen to sign the TPP, at least they recognised the problems with the ISDS clause. Liberals are willing to sign Australia up with no bars to the ISDS clause. Please spread the news! This is being packaged as just another trade deal but the ramifications are frightening for all the countries invovled..